Song Jin has developed a simple way to align nano­-wires, allowing researchers to easily incorporate them into useful devices such as biosensors. Jin compresses nanowires afloat on water until they're oriented in the same direction. He then transfers the aligned nano­wires to another surface, on which he deposits electrodes using conventional lithography (see "The Future of Nanoelectronics"). 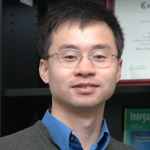 To illustrate his method, Jin created an array of ­nanowire-based transistors. Each cluster is a group of electrodes converging on a common electrode in the center. Hairlike nanowires bridge the gaps between the electrodes. By outfitting the nanowires with molecules that bind to specific viruses or chemicals, researchers have demonstrated the value of his method for sensing applications: when a virus fastens onto a nano­wire prepared this way, the wire's conductivi­ty changes, just as applying a voltage changes the conductivity of a semiconductor in a transistor. Each nanowire is sensitive enough to register a lone virus particle.